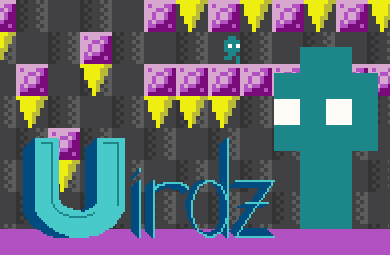 Uirdz is a pretty difficult puzzle-platformer whose main mechanic is dragging the title of each level into the level itself. Some of the words behave in ways related to their meanings. The target times and the secret levels are near impossible, so I suggest holding off on those until you get the hang of the game better. Also, you might want to use a mouse (not a trackpad), or you're just shooting yourself in the foot. Or fingers. A mini-game I made in a week for mini-Ludum Dare #36. The theme was "contrasts." I was a little obvious about it, but I mostly used it as an excuse to learn as3/flash/flixel. A short platformer we made in 48 hours for the Global Game Jam 2012 using Unity. The theme was "ouroboros", so, like the snake who eats his own tail, you must attack yourself, except a much larger version of yourself. It was nominated for best visuals at our location, the NYU Game Center! The platforming can be a little tricky for novices; the one thing that seems to help most people is if you try to jump when the big guy is falling. That should give your character a bit of a boost. It's all keyboard controls. We used the engine from the Unity 2D platformer tutorial. Programming by paste. Art by paste and Sarah. Music by the Ananas. Sound effects from freesound.org and made with increpare's bfxr utility. 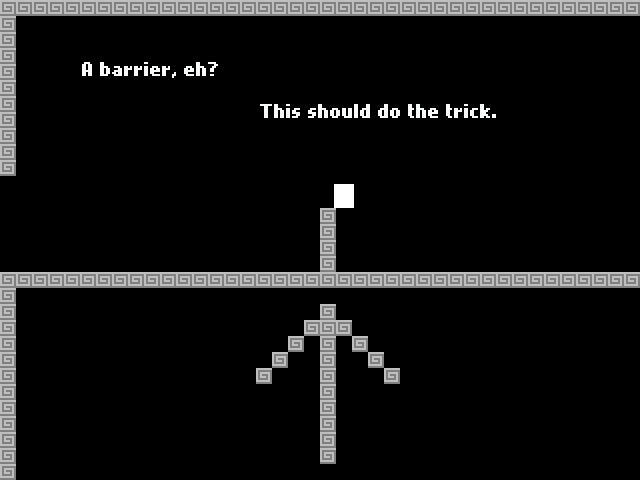 Sometime in 2010, I got tired of games taking so long to make, so I decided to make a game as fast as I possibly could. The result was Beataca, a game I made in a day using Game Maker. Use up and down arrows to speed up rotation and Z to shoot. This 8-bit style 4 person multiplayer game explores the balance between offensive play and competitive racing between two opposing teams representing "Fire" and "Ice." Color coded as blue and purple versus yellow and red, each team of two consists of two characters, one land based sprite and one flying sprite, which work in tandem to move forward in the side-scrolling platform environment. Land bound characters race one another left to right, on the neutral "stone" or "ground" surfaces below, while their doppelgangers above help them through various obstacles by dropping blocks of their respective element (blocks of ice and flame) that they can climb. The element blocks also act as a barrier to the opposing-team's land-bound sprint, who cannot come in contact with their competitors element without exploding in a magnificent display of lights. The air player is then responsible for dropping them back into the world. Through procedural generation, the level adapts to the players' abilities by presenting a more challenging road for the player who is in the lead. Ground players use arrow keys to move and space bar to jump. Air players use gamepads, with the D-pad to move and can set a button to drop bricks before the game starts. Programming and level design by paste and Kevin, sprites and music by Daniel Lacosse, environment art by Sarah, particle and sound effects by Danny Lee. Tides of War was born as a multiplayer versus shmup, something none of us had seen before. It eventually evolved into what it is today: a hectic dodgeball-ish game between two warring crabs. Several different projectiles and items are brought in by the tide. Your mission is to grab as many of these items as you can, with the help of your trusty shrimp companion, to thwack your opponent! Pick up sea urchins or starfish to hurl at your opponent. Plant a spiral shell in front of yourself as a defense to ricochet items back toward your enemy. Use the puffer fish as a slow but powerful weapon. And unleash the awesome power of the laser clam! You have 10 health points to start and each weapon does a different amount of damage. Player 1 uses W and S to move, Left Ctrl to fire. Player 2 uses Arrow Keys to move, Right Ctrl to Fire. Programming and integration by paste, art by Sebastian and Mike, particle and sound effects by Danny. Music from freemusicarchive.org. Sound effects from freesound.org. The goal in developing Equation Blocks was to present the player with a clear and aesthetically pleasing visualization of the mechanics of solving an algebraic equation. The player is introduced to core concepts of algebra, with gradual addition of new concepts as the player advances through the game. The game is structured to encourage exploration of the mechanics of algebra without the pressure of possible failure. Variables and constants are portrayed as colorful blocks and spheres, with algebraic operations being illustrated as physical removal, addition, and separation of the objects in the visualization. All programming and visuals by paste. Title music by paste. Level music from freemusicarchive.org. Desdemona is a puzzle game that was developed around a mechanic that would help middle school age students familiarize themselves with fractions. The goal of each level is to flip the pieces on the game board so that the number of black pieces on the board represent the correct percentage the level asks for. The math-oriented aspect of the game is coupled with an Othello-like gameplay mechanic, and custom-made music by Brian Petuch. Desdemona offers 12 levels with three stages each, with a steady increase of difficulty and more complex concepts along the way. All programming and visuals by paste. All music and sound effects by Brian Petuch. My first foray into modern game creation, Prime Beef!! is a classic shoot 'em up modeled after the arcade game Galaga. The thing that sets it apart is that instead of firing wildly into an array of space-bugs, the player is confronted with alien cows with numbers on them. The player chooses a numbered weapon. If the cow he shoots has a number that is divided evenly by the weapon's number, the cow is destroyed; otherwise, the cow fires back! There are twenty levels total, the second half of which use polynomials rather than integers. Prime Beef!! won second place in 1st Annual Games For Learning Design Expo! Sound effects from freesound.org. Everything else by paste.